Our professional guide Kato-san shows a special radish, which was once a specialty of Kameido, a district in the down town Tokyo. Rediscovery of old tradition also belongs to the contemporary fashion. 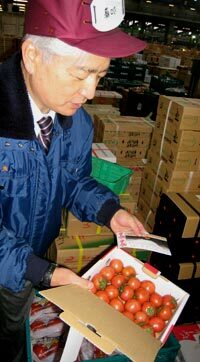 Recently I had a chance to visit the Ohta Wholesale Market with professional guidance. 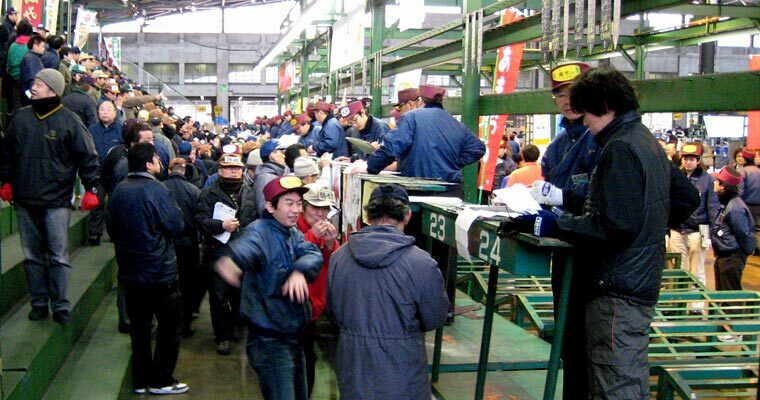 Ohta Wholesale Market is one of the central wholesale markets administered by the Tokyo metropolitan government. While Tsukiji Wholesale Market (cf. "Kanno) is the largest fish market in Japan, Ohta Wholesale Market accommodates the largest vegetable and fruits market as well as the largest flower market in Japan, because it has to suffice the need of the most densely inhabited area of Tokyo and its suburbs. It dealt with 3,300 tons farm products and 3.2 million flowers every day (2008). The largest vegetable and fruits wholesale market of Tokyo once existed in Akihabara. I often witnessed the busy operations of the market while I was shopping electronic parts in adjacent junk shops. The space in Akihabara became too small for handling huge amount of vegetables and fruits and the market moved to the present site near Haneda Airport in 1989. Vegetables and fruits are brought into the Ota Market around the clock. Auction starts at 6:50 for vegetable and 7:00 for fruits. I was slightly surprised to know this, because I had imagined that auction must take place much earlier. Anyhow, a majority of the products are sold by mutual agreement. Therefore, the number of cartons I could see in the market just before the beginning of auction was much smaller than the number at 2:00 or 3:00 am, our guide told us. Though the role of wholesale market and auction has been decreasing to some extent in the sale of farm products, it is not possible to totally bypass the wholesale market. The importance of auction for price finding also remains unchanged and individual price agreements are always made in relation to the auction price. 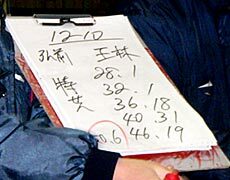 A dealer holds a data sheet in his hands. It shows all apples of a farmer to be auctioned. Apples are categorized according to their size (28 to 46) and the number after dot means the number of carton. 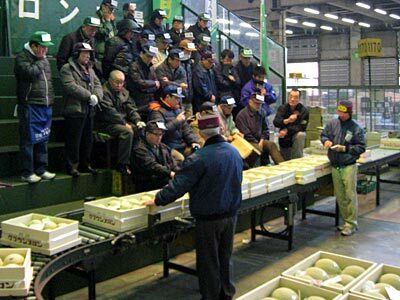 A limited number of experts intensely watch the cartons of melon moving on the belt conveyer. They have to decide in a few second how much they are to pay for a carton with six pieces of precious mask melon. Auction formed the highlight of our market visit. 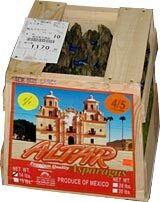 We saw cases where sample products were brought to the auction place and the agreed price was applied to all other products of the same category. For expensive products such as melons, price was decided for each carton. All products in Ota Market are sold by three wholesalers who represent the interest of producers and operate auction. Intermediate wholesalers and authorized buyers (Mostly representatives of retailers' groups) are entitled to participate in the auction. Japanese consumers pay the largest amount of money for tomatoes (1,950yen per year and person), followed by cucumber (1,038 yen) and leek (940 yen). This explains it eloquently why there are so many spices of tomato in the market. Now, popular spices of tomato in Japan tend to have solid and sweet flesh. Sweetness is nowadays extremely important in appealing to consumers and solidity is a desired characteristic so that they are not much damaged through transportation. 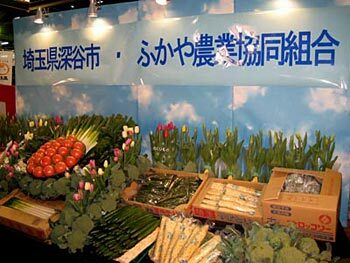 On this day a special event was held at Ota Wholesale Market to promote farm products from Fukaya City, Saitama Prefecture. 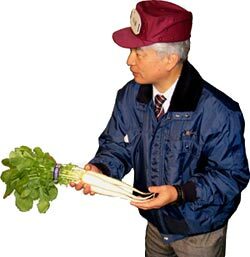 Fukaya is generally known for its leek. But, its fertile soil produces various kinds of vegetables, fruits and flowers ranging from tulip to yam. Dekopon is a citrus fruit, seedless and very sweet. This "amela tomato" is also highly sweet. Of course, organic products and region specific products are desired. There was a corner for the promotion of such products in the market. It is also popular for mayors or governors come to the market to promote products of their municipalities or prefectures. The sympathy of traders can be acquired through personal contacts. Though the volume is not big, some foreign products are also handled at the Ota Wholesale Market. Most of the imported vegetables and fruits do not go through such wholesale markets but go directly to the purchasers. After the end of market visit, we had a breakfast at its canteen. A set of Japanese style breakfast cost only 200 yen and we had a chance to try a novel species of tomato "salt tomato". When tomatoes grow in salty land, they cannot grow large, but contain minerals and intensive sweetness. A novel experience for me.